The issue of Irom Sharmila’s more than decade long hunger strike has touched millions across the globe, including Nobel Peace Prize Winners,- yet it is not even in the agenda of any political party contesting in her own state’s Assembly Elections. Expressing shock and grief, the Save Sharmila Solidarity Campaign writes an Open Letter to all political groups which is published below by Times of Assam as it is, for the sake of the movement. Dear candidates & the representatives of various political parties, As 28th Jan is nearing, the election fever seems to be in air in the 60 constituencies covering about 17.5 lakhs voters. All we get to see and hear are long, promising speeches being delivered by candidates, candidates walking around promising of development, better security and a better future and people contemplating about election results. There are also some blotches like flowing of liquor, attacks on fellow candidates etc. Issues of territorial integrity, road blockades & insurgency continue to dominate the agendas. What is new in the elections is the entry of Naga People Front. Other than that, it’s the same thing with major political parties like People’s Democratic Front, Trinamool Congress and BJP struggling to make their own mark, while Congress is off trying to maintain its record in the state yet again. Like everytime, the political parties are promising different political solutions to the civil and political problems, resulting from the internal conflicts, of the Manipuris. But this time again, like for the last 11 years, all the political parties have chose to forget Irom Sharmila. 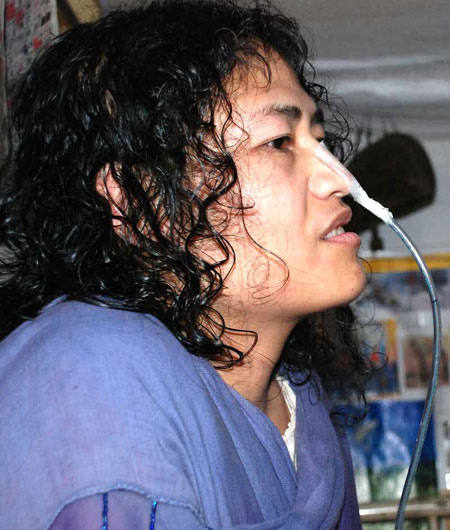 Where is the issue of Irom Sharmila? Why hasn’t any of the political parties raised this issue? Is it some kind of vote politics? If yes, then how are they different from the rest. The issue of Irom Sharmila has now become a global issue. It is a matter of anxiety among many national as well as international organizations and activists. It is astonishing to note that even though many nobel peace prize winners, megsesay awardees, padam recipients, intellectuals and students from across the country and beyond are showing support for Irom and her cause for peace, non violence and humanity, this issue has failed to become a point in the election agendas of political parties in Manipur, Irom Sharmila’s own state. Another astonishing thing is to note that this of a woman is being ignored in a state that possesses more women voters than men. It is known to everyone that Irom Sharmila has been on a hunger strike since the year 2000 but the State Government has not undertaken any concrete steps to resolve the issue. Likewise, the Central Government too has not adopted any positive approach. Irom is under arrest on charges of suicide attempt and the Government has also restricted her meeting with public, family and media. But Irom Sharmila is among the few of those prisoners who have been assigned solitary confinement. This allegation is also not this serious to support such a brutal punishment. The next question is the charge of suicide attempt on a social activist who is fighting for the people. Isin’t this an insult to her struggle? An insult to the people’s sentiments and more importantly, to the democratic way to protest? Moreover, even if we accept this charge, doesn’t solitary confinement increase, rather than retard, suicidal tendencies? All these questions remain unanswered, because government has no reply.This is a clear case of violation of right to equality. But the most amazing part still reserves for the attitude of the electoral candidates in Sharmila’s own state. Why are the political parties silent? We hope and request the representatives of the various political parties to raise this issue in these last days of campaigning. This issue is based on issues of truth, peace and justice. This can restore peace in Manipur. And even if political groups become fail to deal with the issue, we appeal to the general public of Manipur to bring the issue in main concern. Justice is their right. Economic development can be enjoyed only when social development and justice is imparted. We, the people who believe in democratic values, non violence and peace, demand justice for Irom sharmila Chanu and political solution for her demand through talk process. We, the people, also believe that all armed struggles in Manipur should be ended and people of all sides should make themselves ready to be engaged in peace processes. We, the people, have full solidarity with problems of Manipur and we will do every possible efforts to resolve your issues on the ground of humanity. We, the people, who favors humanity, believe that truth is the tool of sustainable development and the real victory will be made in the hearts of people of Manipur rather than in just getting seats in elections. We demand that all, regardless of their other political agendas, should collaborate on this common point to resolve the issue of Irom Sharmila and to impart justice to her as soon as possible.